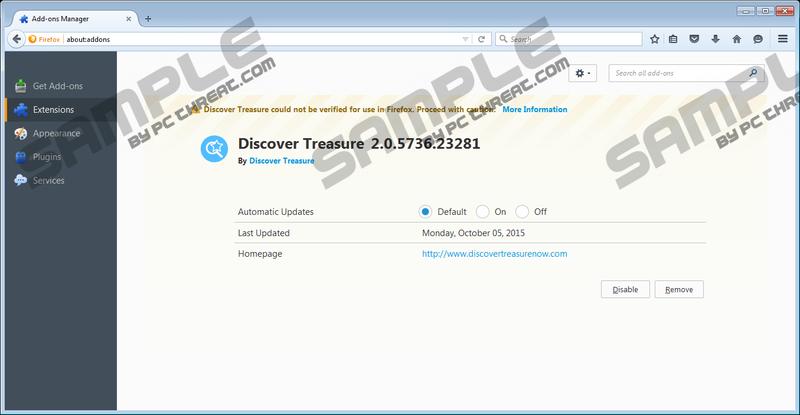 Discover Treasure is an Injekt engine-based adware application. We advocate its removal, because its promoted content comes from unknown third-party advertisers. Based on encounters with similar adware programs, we assume that it may also display misleading advertisements that promote potentially unwanted program, adware, and so on. Apart from displaying advertisements, this application does not do anything else. In short, you should get rid of this program, because it can compromise your computer’s security with its unasked-for and annoying promotions. This article contains the most relevant information about Discover Treasure, so if you have it installed on your computer, please read this article. As previously mentioned, Discover Treasure is based on the Injekt engine. This engine was developed by a well-known adware developer Injekt LLC. This developer has released hundreds of adware programs over the years and there are no indications of it stopping doing so anytime soon. Our research has revealed that like most of Injekt’s adware, this one is promoted on its dedicated website. This website is called Discovertreasurenow.com. Discover Treasure cannot be downloaded from this website, because its only dissemination method is software bundling. Software bundling involves including several programs into one installer. Programs like Discover Treasure are always hidden from plain sight in the advanced or custom section of the installer. Therefore, you ought to exclude the likes of Discover Treasure from the installation process by unchecking their checkboxes. If you have accidentally already installed this program via a software bundle, then we want to inform you that your computer’s security has been compromised. Indeed, all adware programs are deemed unreliable as they tend to promote products and services that come from unreliable sources. It is possible that the ads will be fake. A simple Java update advertising may actually infect your computer with serious malicious programs that will be quite difficult to delete. Therefore, you should be wary of promotions that seem to be out of place. And how can they not be if Discover Treasure can display pop-ups, banners, coupons, search-related ads, interstitial ads, and so on. And, they are often displayed several at a time on most webpages. In order to make their ad campaign more effective the developers at Injekt have built in certain functions into Discover Treasure so that it could be used to gather information about the people who have installed it. This program collects non-personally identifiable information such as your IP address, internet provider’s name, geographical location, and browsing and search history, among other types of information. This information helps them assign certain ads to unique users and, thus increase their ad campaign’s success rate. We hope that the information we have provided in this short article was of some use to you. After testing this program we have come to the conclusion that it is an unreliable piece of software that does not improve browsing experience in any way. Its only purpose is to make money for its creators and advertisers, while you have to deal with irritating ads. So if you have this program and you have had enough of it, then we have included a guide that will help you remove Discover Treasure. Locate Discover Treasure and Remove it. Locate Discover Treasure and Uninstall it. Quick & tested solution for Discover Treasure removal.